A record number of wineries, nearly fifty cultural programs, a tractor tour and a large number of performers await visitors this year from Oct 6-8 to one of the most well-known harvest festivals, the Villány Red Wine Festival. In Villány, in the "City of Grapes and Wine" it is an old tradition that the harvested grapes are greeted by the locals with a colorful harvest procession and a fun party that lasts till the morning. 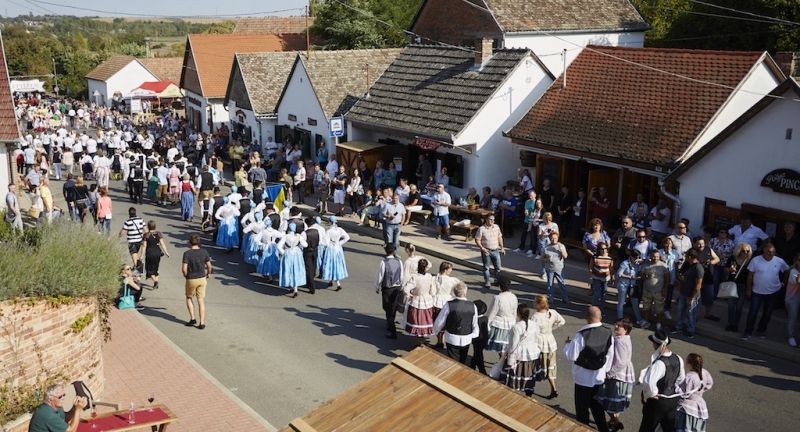 This traditional Villány Red Wine Festival has been celebrated the first weekend in October each year for the last 30 years by the city of Villány, along with the Villány Wine Order, which was founded in 1988. Today, tens of thousands of people are attracted to this three-day event, which celebrates the culture of wine and gastronomy and the preservation of tradition. Besides wine of course, this multi-cultural event, which is one of the biggest events in Hungary, also promotes the city’s quality and vitality and its prominence as a tourist attraction. Ticket Information: Daily Ticket-1,500 HUF Festival Ticket: 2,500 HUF (Friday and Saturday) Sunday is FREE. Admission for all 3 days for children under 14 is FREE. From Pécs and Mohács there will be Festival Buses going to Villány and between Pécs and Villány a train.